Hope someone can help, since two Ford dealerships have thrown up their hands and said, "I don't know how to fix this." Yesterday, when I got in my car (it has 42M on it and is almost 3 years old), it said my Key Battery was low. I stopped at Interstate Battery and they figured out how to replace both FOB button batteries (with help from a YouTube video). Unfortunately, the message is still coming up when I start the car. I even removed the round steering stalk plastic piece and stuck my FOB directly inside (2nd dealership said to try this since it possibly could help reset itself if it was inserted directly). Two stops and starts later, the message is still there. The car starts fine. Doors unlock fine. No driveability problems. 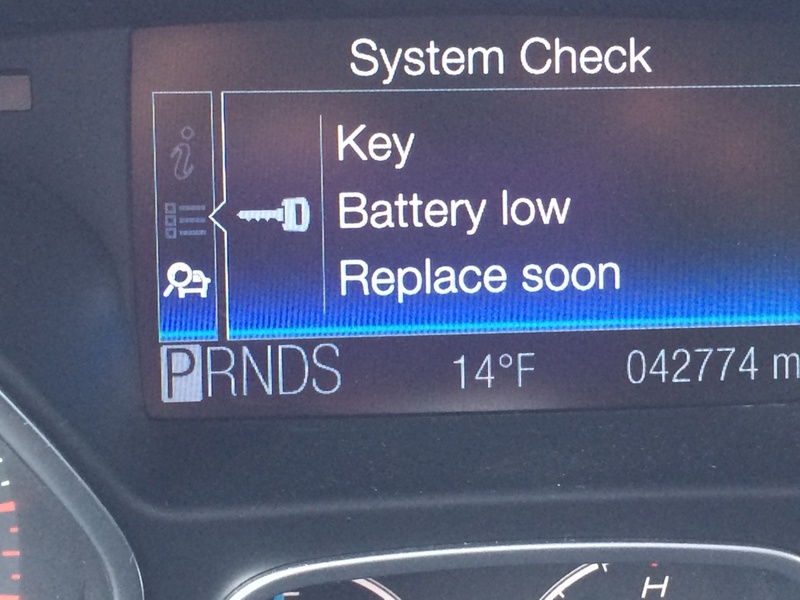 Is there ANY way to reset this message to make it go away (like the oil change reset sequence that I occasionally perform, for instance)? Both dealerships said if I brought the car in, they "could take a look." Read...CHARGE ME $$ for trying a bunch of things. I may be a woman, but I am very computer savvy and can follow reasonable instructions. I do my own MyFord Touch updates without help. I can navigate my car's gizmos without any issue. The guy at the dealership also insinuated that my iPhone could be the culprit. Huh? I connect it ALL the time when I'm in the car, and this has never been an issue. So, with that, can anyone give me some simple advice or am I stuck spending my hard-earned money having some dude scratch his head for a few hours? Disconnect the battery, that should reset the computer and turn off the message. What settings will I lose on MyFord Touch by doing this? I have a lot of customized Sirius stations, Alerts for songs, custom wallpaper, etc. how long does the battery have to be disconnected? Thx. Not sure what youd lose but those fob batteries have been known to not always be sold with a full charge. You could also attempt replacing your fob battery with another new one. Walmart sells 2 packs of them for $4 in the watch section. Bad advice. Never "reset the computer" arbitrarily. The fob battery is fine and the message will go away. what you're saying is that you have replaced the battery in the fob and the message eventually went away? OP! Try going into the information menu on your thumb menu and into system status. I think you can reset it from there. You might have to hold the ok button to reset it. I'm not by my car or I'd check. Since changing the batteries in the keyfobs didn't get rid of the message, I decided to disconnect the battery yesterday. I disconnected the positive terminal for a couple of minutes and then reconnected it. The message is now gone and everything is working correctly. I haven't had this issue yet however.